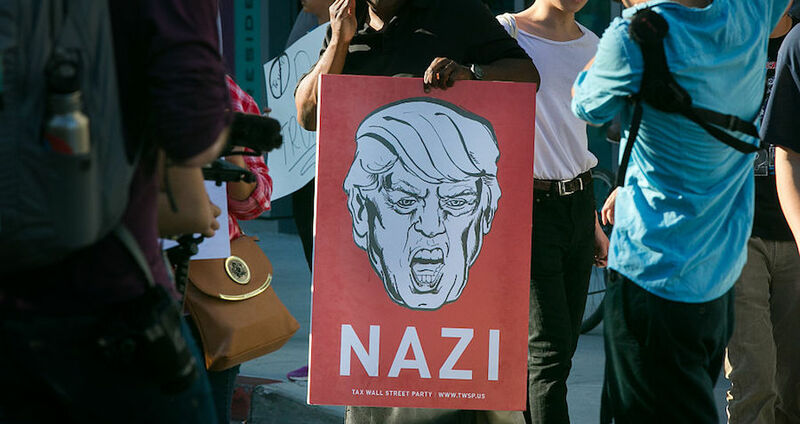 Elijah Nouvelage/Getty ImagesA man holds a sign declaring then Republican presidential candidate Donald Trump a Nazi outside a campaign rally on June 2, 2016 in San Jose, California. Donald Trump’s victory in last Tuesday’s presidential election has caused some to celebrate, others to protest, and some to head to the dictionary. Merriam-Webster recently announced that searches for “misogyny,” among other similarly troubling words, have surged in the days following Trump’s win. The top Merriam-Webster searches from election week, in descending order, were “fascism”, “bigot”, “xenophobe”, “racism”, “socialism”, “resurgence”, “xenophobia”, and “misogyny”. If tweets like this have you yourself wondering what exactly “misogyny” means, it means “a hatred of women,” according to Merriam-Webster. On the other hand, “misandry” means hatred of men — but this country rarely needs to use the word. Now, if you knew what “misogyny” meant before reading the paragraph above, Merriam-Webster sympathizes. And if you can read between the lines, their Twitter feed in the past couple days has been especially poignant. "Let's publish a new Trend Watch today!" "But there aren't any new trends. The same words have been trending for almost a week."